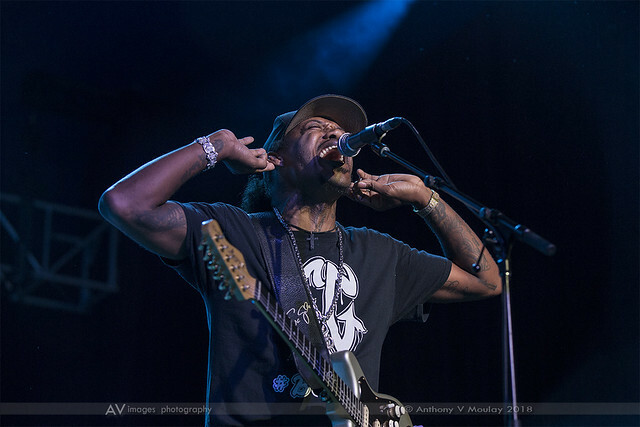 The Diamond 30th anniversary began for Bluesfest with some new gem acts on the bill. We managed to scrape through the first day with very little rain but 99.9% humidity. This first night roll-up sees Bluesfest upping the ante by rolling out some of the big guns on their roster. 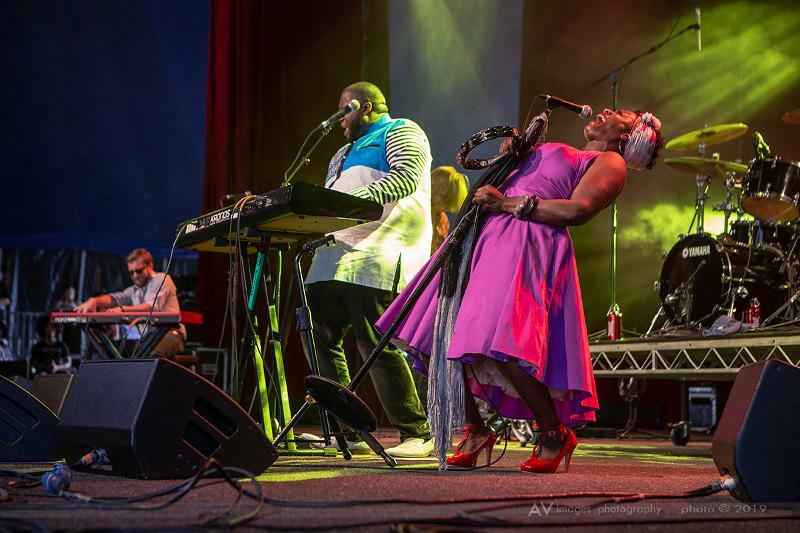 Their first time to Australia and Bluesfest The War & Treaty, husband & wife, Michael and Tanya Trotter, fronted southern soul act fast became favs for those in the Delta tent. The Bluesfest audience won their hearts as well. 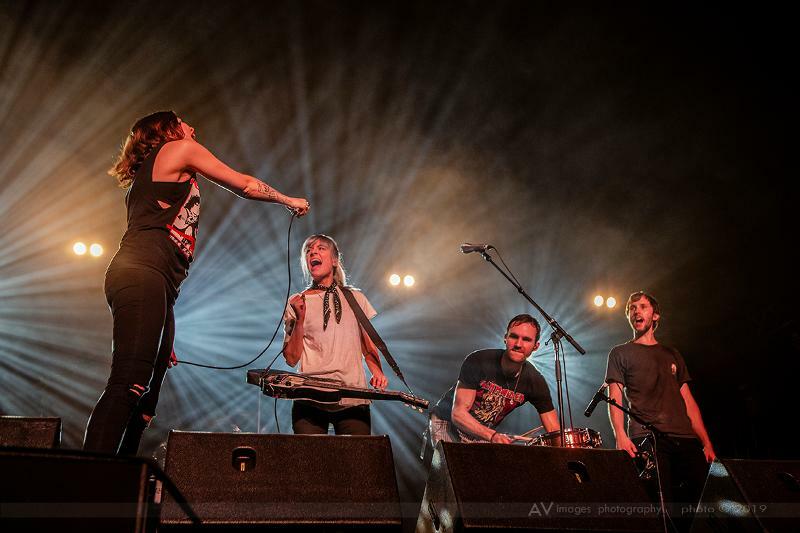 Their complementary vocal range, energy and great stage presence provided an aural and visual feast. Chicago Blues gospel royalty Mavis Staples and band gave us a solid if what slightly jet lagged performance which included their rendition of the Talking Heads track Slippery People which also appears on her last test Live in London release. Her superb band delivered with guitarist Rick Holmstrom shining, Donny Gerard & Vicki Randall on vocals, Jeff Turmes on bass and vocals, and Stephen Hodges on drums. Freedom Highway written by her father Pop Staples was a great crowd favourite. 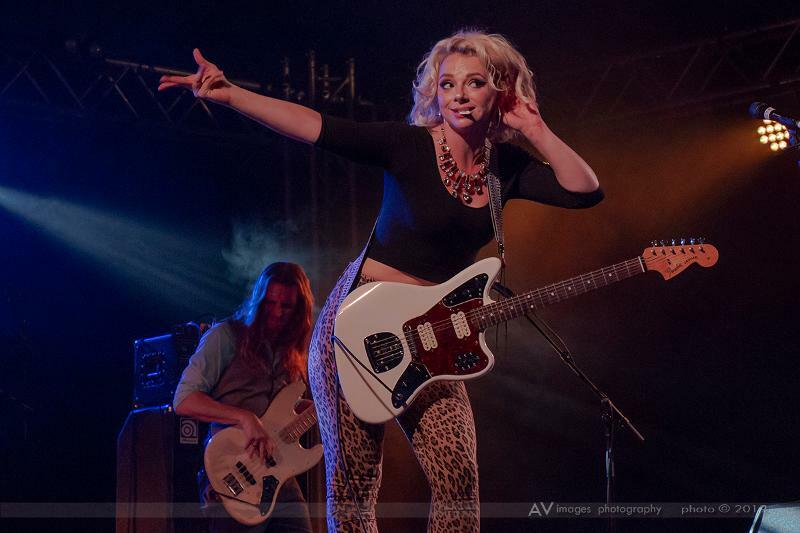 Another new comer to Bluesfest Samantha Fish sparkled - mentioning that she was finally living her dream of a Bluesfest debut. She opened her set with American Dream from the Luther Dickinson produced Belle of the West album from last year. Despite some poor quality vocals mix her set was high energy blues rock, she and her wonderfully tight band had the audience eating it up. The traditional, best know as a Skip James track, Crow Jane finish out the set on slide Cigar box guitar. Opportunities to catch her today @ 10 pm up against Iggy. She will also be playing Saturday & Sunday and we will definitely be at these sets to see her again. Fantastic Negrito sporting his version of a Sideshow Bob hairdo in his second Bluesfest appearance gives an amazing artistic performance resplendent in green flares and again a super tight, well polished band with his off the cuff between song banter. South Carolina based Markus King band gave us some sweet Southern soul blues to finish the night, again in the Delta tent. We were only staying for several songs to try and beat the inevitable car park rush which actually didn't happen but ended up staying to the finalé....mighty fine guitar work and singing from this very talented twenty something musician. Another must see...Friday at 3.30 and Sunday at 6pm both on the Crossroads stage. 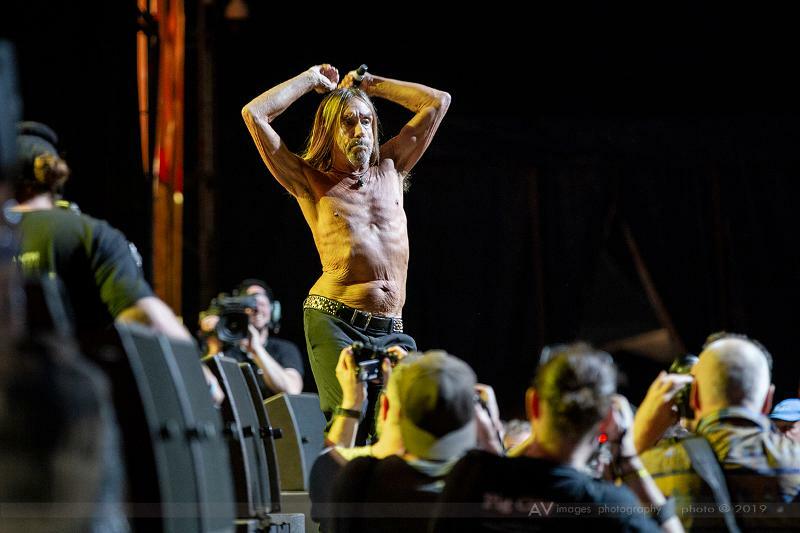 Looking forward to some more great blues acts today with Backsliders, Gary Clark Jr., Melody Angel, Marcus King Band, on the menu…but the must see act for Friday has to be Mr Iggy Pop on the Crossroads stage at 10pm! Bring your wet weather gear as it's bucketing down! Yep it's Easter and it's Bluesfest 30th Anniversary Festival!! ...and the heavens opened. The rain certainly came today...which means the punters didn't really get going until later on in the day. By nightfall even the torrential rain couldn't deter them. Gary Clark Jr, The Backsliders , Samantha Fish, Hussy Hicks, The Marcus King Band, Ruthie Foster, St. Paul & The Broken Bones, Arlo Guthrie, Deva Mahal, Melody Angel, Clarence Bekker Band, Glenn Cardier and The Sideshow, and Iggy Pop were all on our dancecard for today. Well, our intentions were noble but quite unrealistic. So only arriving on site at 4pm we made it straight to under cover to dodge the latest downpour. After a cooling refreshment, as the humidity is debilitating and you know how important hydration is we made our way over to the Mojo to witness St Paul & The Broken Bones' at their third Bluesfest in four years. Other acts we made it to and worth the effort were Backsliders, Gary Clark Jr and to round out the night Iggy. 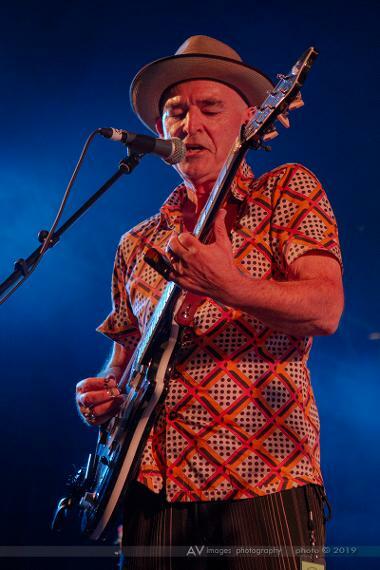 The achievement award goes to The Backsliders who have notched up 14 performances at Bluesfest over the 30 years! Add in individual members other guises & they would nearly have performed on each bill. The nimble 72 year old Mr Iggy Pop delivered an energetic set to close out the night . Iggy proved if you have a "Lust for Life" you can continue performing & outlive many of your peers. He took a shot at David Bowie for stealing his poetry & later delivered an electric rendition of Jean Jeanie. 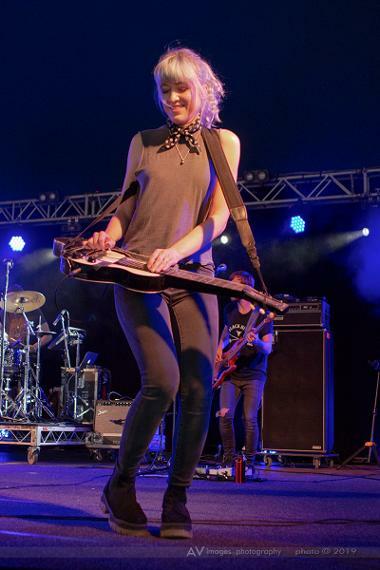 Day three awaits with more performances by Mavis Staples and band and Samantha Fish.The first timer must see act for today will be Larkin Poe on in the Delta at 3.45pm. 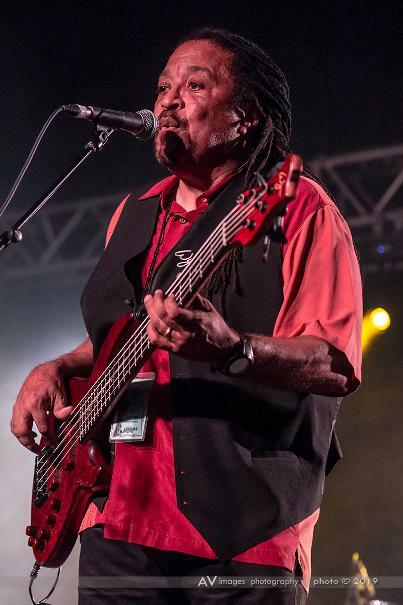 Also on today worth mentioning are Archie Roach, Tommy Emmanuel, Keb' Mo', Little Steven & The Disciples of Soul, Lukas Nelson & The Promise of The Real, Ben Harper & The Innocent Criminals...see you there!! The start of collaborations - Ben Harper Saturday. Saturday saw a huge crowd gather to witness Ben Harper on the Mojo. He was everywhere yesterday, joining Mavis Staples (he produced her latest album) on the Jambalaya stage then over with Kasey Chambers on the Crossroads. Yothu Yindi had special guests up to perform their finalé Treaty. The Veronicas and The War and The Treaty also popped up on stage for a guest appearance with Kasey. Vintage Trouble on their 3rd visit were high voltage from the outset. Ty’s stage presence & athleticism wowed the Mojo. Run Baby Run saw Ty pull his crowd surfing out! Ty also show prowess on the ‘bone. 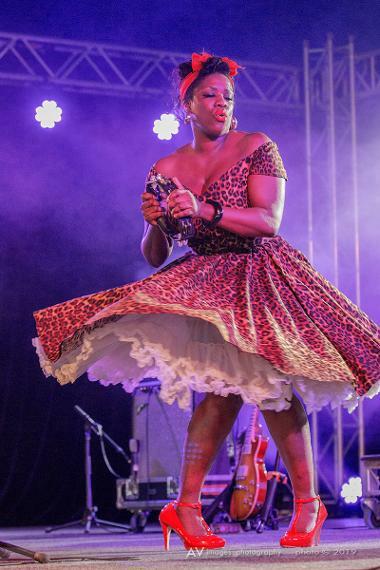 Word got out about how good The War & Treaty were and they performed to a jam packed Juke Joint tent (the smallest of the five stages at Bluesfest). Humbled by the overwhelming response, they gave some of their best R 'n' B / soul in the hope of getting another invite back onto the next Bluesfest ticket. Blues on offer was delivered by Mavis Staples (Gospel/Soul), Keb’ Mo’ (acoustic blues in solo mode), Samantha Fish (blues/rock), and the aforementioned Larkin Poe (contemporary slide/blues/rock duo). 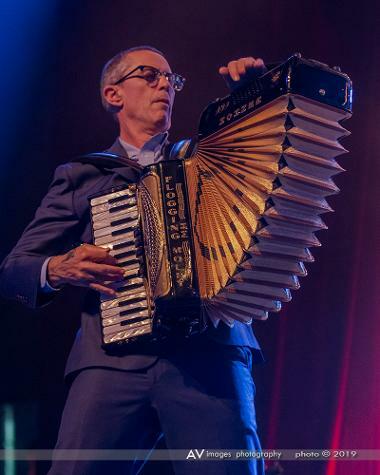 We also threw in some "punk" with American/Irish group Flogging Molly pulling out all stops in an energy pack fun filled, sweat inducing performance! To finish out our night we came back to where it started for us in 1996...our first Bluesfest. 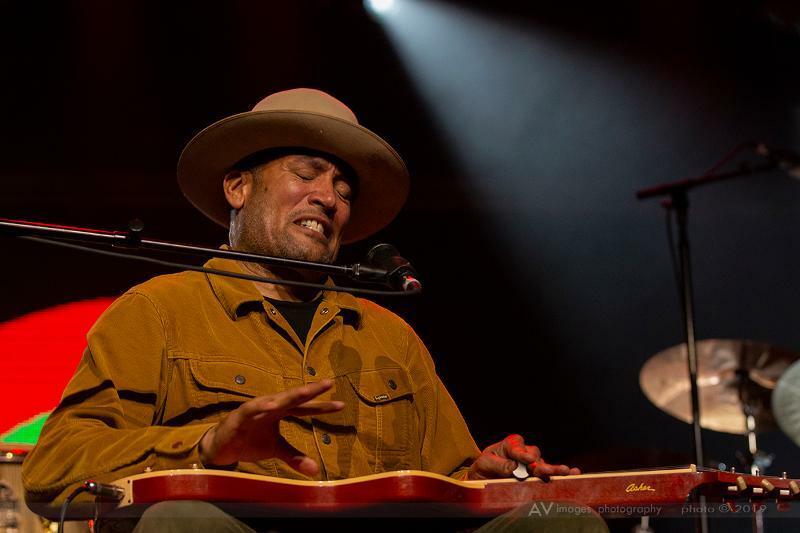 Ben Harper covered a fine selection of his back catalogue of songs with the Innocent Criminals in his over 2 hour set including “Whipping Boy”. 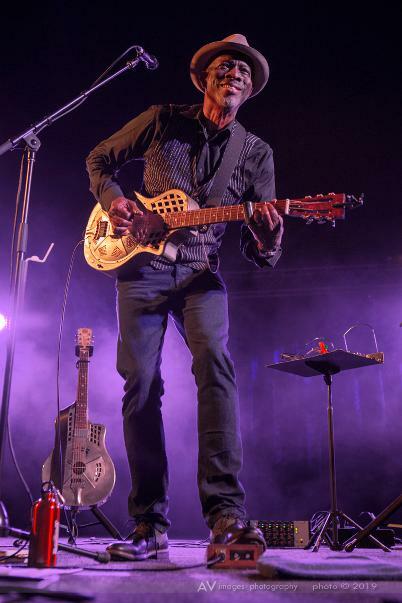 Harper, who debuted Bluesfest in 1996, was joined for collaborations on stage by Casey Chambers & his soul "brother" Jack Johnson. Jack played “Own Two Hands” with Ben - the crowd were suitably appreciative. Leon Mobley kicked off perennial favourite “Burn One Down” for the final song of the encore. Set included covers of Bill Withers “Who is He (...and what is he to you? )” and Stevie Wonder's “Superstition”. Ben covered Superstition at their Bluesfest debut in 1996 at Red Devil Football field (how did the Bluesfest fit on those grounds?) and where his music connected strongly with the Bluesfest audience. He’s been a crowd favourite ever since! Day 4 - Sunday - Happy Easter! Happy Easter Blues Sunday - A break in the wet weather sets the scene for today. Tex Perkins & The Fat Rubber Band performed some early Cruel Sea - “Alright 'cause she loves me” & “Not the way home”, Matt Walker taking on guitar duties, along with Steve Hadley on bass are just two members of Tex's current band. The War & Treaty last set of the 'feast gave us a heartfelt finish to their 4 shows. They were pretty sure they’ll make it back again. Their new song “5 more minutes” was popular with the punters - all singing along to this catchy chorus & was mentioned it will be on their new upcoming album - "dropping" soon. Finishing with a solid version of their track “Down to the River”. The Marcus King Band settled into a groove in the larger Crossroads stage and pulled out a fine version of “Don’t you mind people grinnin’ in your face” in amongst his blues/soul/rock set. I can imagine this will be the first of many visits to Australia for this young musician. I was told Gary Clark Jr. had some guests up on stage in Lukas Nelson & Marcus King and they performed Gary's track "Don't Owe You a Thang" together, each taking solos in turn! I would have liked to have seen that, unfortunately we can’t get to everything at Bluesfest because it is just so vast! Larkin Poe earlier in the day did a short on-site interview in the BayFM tent with Sista Mary. They ended the interview with an accapella version of the traditional “Wade in the Water”. Their powerful final performance played with sincere passion and joy showed that they were having a ball of a time. They ended their final performance with a semi acoustic version of Robert Johnson's Come on in my Kitchen...I'm hedging my bet that this is the start of a long association with Australia and the festival. Their performances over the weekend was great exposure for them - the CD shop had to keep restocking their albums which is a good sign of their expanding fan base here in Australia . Backsliders produced another solid performance, playing for an hour and a half…it’s quite amazing that there are still punters who have never heard of this long-time Australian institution of Australian blues music. It was great to see they had the Juke Joint Tent nearly full from the start of their late set. Giving today’s headline, Jack Johnson, a miss we headed to The Crossroads Stage and capped off our night with the hyped up funk machine that is George Clinton & Parliament Funkadelic. They well and truely funked up the whole tent & got the crossroads crowd moving their butts from the outset. On the stage it’s hard to know where to look - all band members are true entertainers, there is so much non stop action on stage, costumes are fantastic, throw in an acrobatic act as well as some booty shaking backing singers it is no wonder these are referred to as “musical viagra” by George himself. These tired and weary bones have one more day...what we put ourselves through it just so you can all live vicariously through us! I suppose someone has to do it so we soldier on!